William Edward Powell was one of the more colourful squires of Nanteos. Born in 1788 the eldest son of Thomas Powell, his father had died when he was just nine years old. After a bruising childhood educated at Westminster School and domiciled largely in London with his mother and younger siblings, he rapidly setting about making his mark on attaining his majority on 16 February 1809. 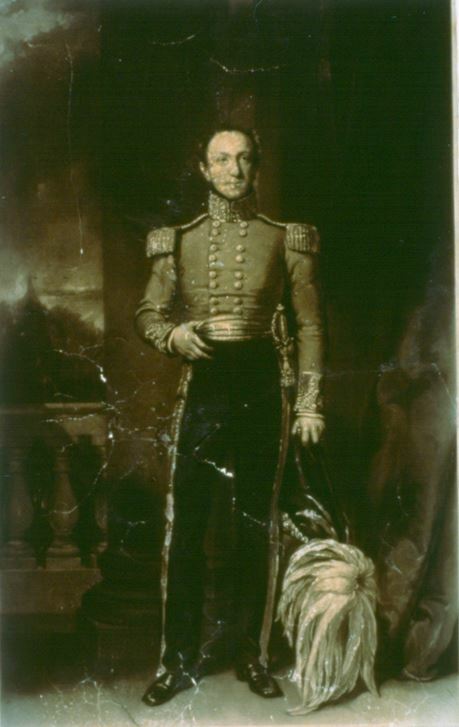 The young Captain in the Royal Horse Guards held a lavish coming of age party at Nanteos at which his mother and sisters were perforce absent, exiled by debt to Dublin. In the preceding months he had been living it up in Bath, and sending for game from his estate to feed his guests. Gossip had already linked him to a beautiful young lady – one of a numerous family – and the Nanteos Agent Hugh Hughes recorded the rumour that Powell would be married by 16th February and that the Birthday would be also a wedding visit. Within the year he had reclaimed management of the Nanteos estate, commissioned the valuation of the Nanteos plate (1757 ounces of silver valued at £527.6s 10d) and commissioned a handsome survey of the many Powell properties in Aberystwyth. Demands on the estate included his mother’s substantial unpaid debts, amounting to £5,500 and the likely dowry requirements of his sister Elizabeth who would be owed £5000 at marriage or on attaining the age of 21. None of this deterred him from an early marriage, on 4 October 1810 to Laura Phelp, who was probably the sweetheart with whom his name had been linked the previous year. In the same year Laura’s brother Edward sought the hand of Powell’s sister Ellen Elizabeth, thus creating a second link between the impecunious Phelp family of Leicestershire, and the financially embarrassed Powells. They were married in 1811. Reporting on his three unmarried daughters, Julia, Octavia and Fanny, he continued: “Powell has taken the majority of Cardiganshire and is now with Fanny at Lochrea Ireland. Julia and Octavia are at present on a visit near Bath. They were not at the Cardiff races which ended about ten days since and was numerously attended, although the sport was not good owing to the goodness of Powell’s horses, Banker and Ad Libitum. They won everything and are expected to do the Principality. I wish at the time we were at Hunters – you could have contrived to have paid us a visit there as you was to have painted them and Prospero who is the finest horse I think in England if not in Europe”. Nothing I have found in the Nanteos archive mentions Powell’s racehorses Banker and and Ad Libitum so we may speculate as to whether Powell’s investment in racing was prolonged or a success. The tone of this letter implies that his horses were in fact too good for the Cardiff races, and so the betting was unexciting. Prospero may also have been Powell’s horse, or alternatively another horse which James Phelp greatly admired and wished his friend and protegee Weaver to paint. I hope that a racing historian may eventually throw light upon these names. What is certain is that while Powell pursued the enthusiasms of a young gentleman of his class, his financial situation was extremely perilous, and remained so. In February 1810 he had also received the nomination for High Sheriff of Cardiganshire, a post obliging the holder to entertain in lavish fashion. Powell’s lawyer was so alarmed at the prospect that he advised Powell to obtain notes from his physician and apothecary in support of his inability to do business of any kind. Powell did not heed this advice and continued to duck and dive through the following years, neglecting his wife Laura, supporting a mistress, and consorting in the Prince Regent’s entourage in London. In 1822 Laura died, and the next year Powell narrowly avoided bankruptcy, only by the sale of unentailed land in Montgomeryshire.